This is a really great 9 Inch Wicket Border plate, Line No. 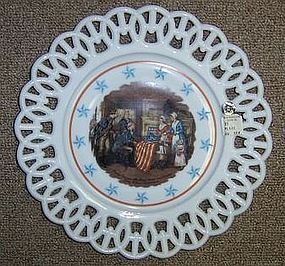 30, featuring Betsy Ross and The First Stars and Stripes - John Ward Dunsmore, which is signed on the plate. This plate was made by Westmoreland Glass from 1950 to 1976. It is one of the four 30-1 Revolutionary War Series. It can be hard to find. It is in excellent condition with no chips or cracks. The decoration is all very good. The original label is attached. It is not signed. Be sure to see our other Revolutionary War plates. We guarantee all items to be as described. THANK YOU.